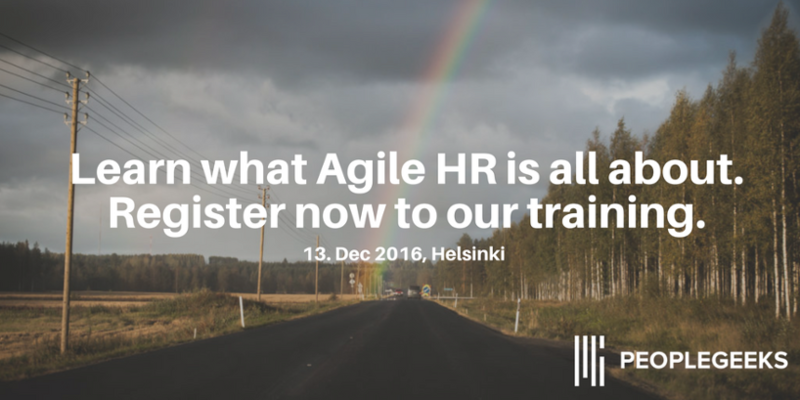 Agile HR is even worse of a trendy slogan, with it’s many interpretations. Agile HR is used in very strange context (such as digitalization, adoption of technology, or “flexibility”). Hearing people who clearly have no idea about agile speak about agile HR sounds like an emperor riding without clothes (pretending to know agile) on an old horse that is about to pass out and die (traditional HR). I’m afraid Agile HR is turning into what Swedes call “putting make up on the corpse”. Agile HR is the 2016 buzzword to insert in the CHRO powerpoints, turning HR now into an agile business partner. Sorry peeps, if it means running a function, which builds on the industrial 100-year old management paradigm you are not agile, no matter what you write in your power points. Please, do your homework before talking about agile. I hope to come across more HR professionals who are Scrum Masters, SAFe agilists, LESs certified, Lean certified and/or LeanKanban certified. We are a very small group currently among our profession. The big consultancies have their own views, the HR gurus have their own explanations what Agile HR is all about. I welcome different views happily, but they haven’t satisfied my need for simplicity, consistency, level of abstraction and logic. I really haven’t come across a great definition of Agile HR, which satisfies me. Agile HR = Designing HR to support and organization that works according to agile methodologies. Designing the people practices to support agile ways and methodologies of working, the agile organization model and the agile cycles. Whether the teams in the organization use SAFe(R), Less, Scrum, Kanban, XP, Scrumwaterfall or ancient half-naked tribe-dancing to get their work done, you in HR need to understand the system/context you are designing for. Knowing the context you design for is the most important, and since organizations, business situations, the legal constraints and culture are different in different companies, AgileHR should not and cannot be written as recipes. Benchmarking HR processes is dead. Agile HR = Using agile methodologies and real cross functional teams in HR for stepwise incremental development. HR is developing “people services”, management practices and basically UX for work. We can use Scrum, Kanban, Lean Startup or SAFe as a philosophy and methodology. We can create this UX for work within cross functional teams, including other support functions, such as communications, strategy, finance, too. Agile HR = following the values and thinking in the agilemanifesto.org and the agilehrmanifesto.com in all you do. This is Agile HR (for me), in all its simplicity. In my little mind, all of the nuances, the different practices, the use of technology (just a vehicle) and the agile values are contained in those three points. I welcome any opposing ideas, because I really have tried to bust this definition with something better during the last three years! If you would like to lean more about #AgileHR you might want to checkout our training offering within that domain, welcome to join! P.s. I define LEAN HR in a similar way.